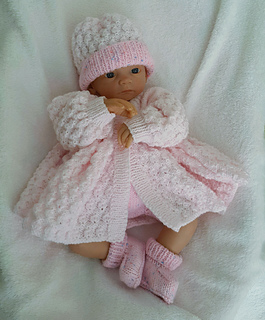 Lorna is a traditional Scottish girls name and the pattern name is inspired by the mock fairisle yarn which is used as a contrast yarn on the trousers, brim of the hat and body of the booties. 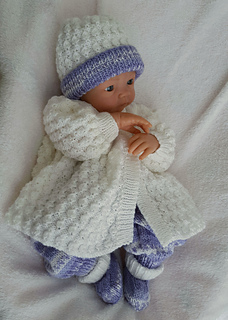 I love to see new babies in hand knitted outfits. 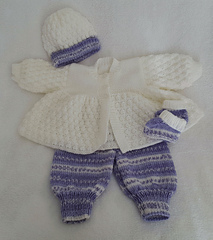 The pattern uses a pretty textured bobble and stocking stitch design used throughout. 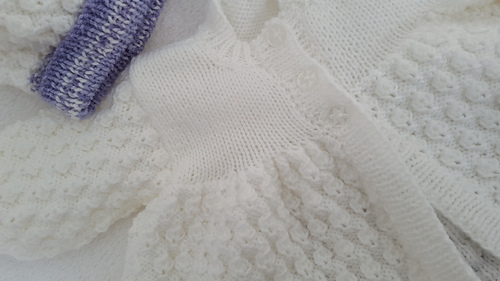 To knit the set you will require approx 300g of Baby Double Knitting Yarn (Light Worsted) in Two Contrasting Shades, 3 Buttons and length of 6mm ribbon for the waist of the trousers.